Welcome to Wisconsin Aviation's headquarters in Watertown, Wisconsin! The Watertown Municipal Airport was commissioned in 1945 and has grown from two short grass strips, a few buildings, and seven aircraft to a modern facility. Currently, the airport is called home by over 90 aircraft owners. The facility has three non-precision approaches. 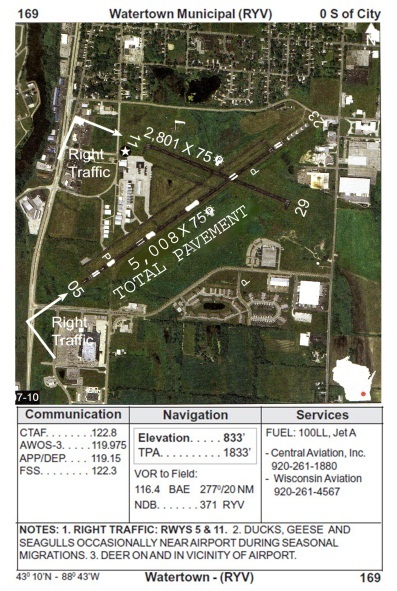 Wisconsin Aviation, Inc., maintains its corporate headquarters on the grounds of the Watertown Municipal Airport, Watertown, Wisconsin. As the FBO for the city's airport, we provide a full array of aviation services to include: charter service, flight training, aircraft sales, aircraft maintenance, avionics repair and upgrades, interiors repair, fueling, tie-downs, and hangaring.